That’s Macadamia Helmets and Almond Footballs. They are Almost too cute to eat. ...... Almost. I updated these awestastic (You know, since people are making up words these days. I mashed up awesome and fantastic.) 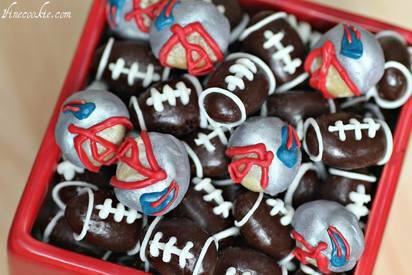 nuts for the Superbowl. I had no choice but to switch them up a bit, because the Patriots blew it. They lost out on an extraordinary and rare opportunity this season. Very few will ever make it to this point, and even fewer succeed more than once.